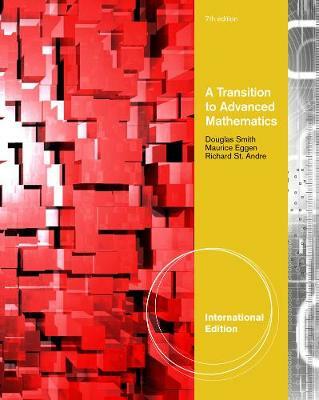 A TRANSITION TO ADVANCED MATHEMATICS, 7e, International Edition helps students make the transition from calculus to more proofs-oriented mathematical study. The most successful text of its kind, the 7th edition continues to provide a firm foundation in major concepts needed for continued study and guides students to think and express themselves mathematically-to analyze a situation, extract pertinent facts, and draw appropriate conclusions. The authors place continuous emphasis throughout on improving students' ability to read and write proofs, and on developing their critical awareness for spotting common errors in proofs. Concepts are clearly explained and supported with detailed examples, while abundant and diverse exercises provide thorough practice on both routine and more challenging problems. Students will come away with a solid intuition for the types of mathematical reasoning they'll need to apply in later courses and a better understanding of how mathematicians of all kinds approach and solve problems.